Important Update: After actively erupting lava since 1983, Hawaii’s most active volcano in recent history has paused erupting in August 2018. It very well may start erupting again, so we will leave most of the references to the volcano activity in this article, with strike-through text. Though it is disappointing that the lava isn’t actively flowing, this day trip is still worth doing! One of the most exciting attractions in Hawaii, the Big Island, is the active volcano Kilauea. The challenge that many first time Hawaii visitors discover is that the volcano activity is on the Hilo side of the island while the beach resorts are situated on the Kona side of the island. The Big Island is big indeed. It’s bigger than all the other Hawaiian Islands combined. With much to explore on each side of the island, ideally we recommend visitors split their Hawaii stay between the Kona and Hilo sides of the island. Though, we know that a split stay doesn’t always happen. That’s why we’re creating these tips for a day trip from the Kona side to the Hilo side. Prepare for a long, but exciting day of exploring. On one of our trips to the Big Island, we set out on the road to the Hilo side at about 7:30am and didn’t get back to our Kohala resort until about 10pm. Go ahead and get your mind set that you’re going to have a long day and make the most of it. Though your day trip may be long, it will not be boring. There’s much to see and many stops along the way that will keep you energized as you’ll see further in these tips. Lava viewing is best at dawn, dusk and dark. Our tips will provide you with a full day of activities with the aim of seeing lava at dusk and dark. If you’ve traveled across the Pacific Ocean to see lava, you might as well make a point of seeing lava at its best. 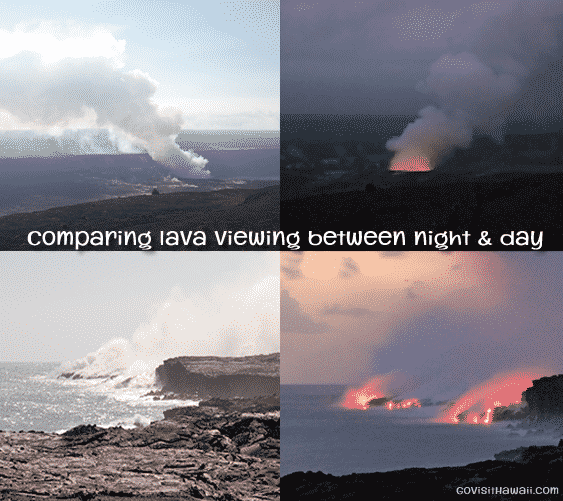 This comparison of lava viewing shows the daytime view (left) to the exact view at dusk. What do you wear and bring? Sunscreen, mosquito repellant, hiking shoes or sneakers with good tread, flashlight and water are all musts. It’s also useful to bring binoculars, camera, GPS device and wear long trousers. Read more detailed tips on our post with advice for viewing the Big Island lava. The earlier you can set out, the more you can see and explore in daylight. Try to start your day trip before 9am. Ideally, we recommend a 7am start. Which way do you go? Make your way to Waimea. We recommend you drive Highway 19 around the northern end of the island — going through Waimea and the lush, undeveloped Hamakua Coast. By following this route, you get to enjoy some short diversions to gorgeous scenery, which we will describe further in these tips. We’ve driven this northern route many times. It’s beautiful to see the morning sun waking up this part of the island. 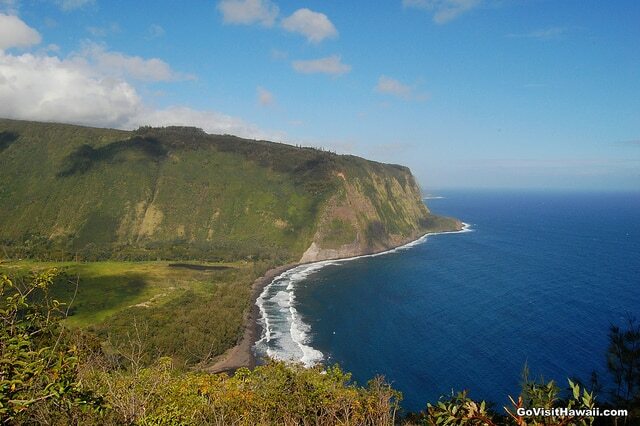 Views like this one of Waipio Valley will keep you energized for the long day ahead. By following our recommended route and stops, you catch some of the Big Island’s most beautiful scenery– from valley views to cascading waterfalls. We’ll list the stops in order. Check each link for additional information, photos and tips. – Waipio Valley is located off the main highway. From Highway 19, turn onto Plumeria Street between mile markers 44 and 43. Then turn left at Highway 240 and follow the road until it ends. After your visit here, get back onto Highway 19 to continue the journey. If you can carve out extra time here and you can time your visit to their tour times, we highly recommend the Waipio Valley Shuttle tour. Ideally, their 9am tour would be best, but you usually have to contact them about booking that tour time. – At mile marker 43, if you need a snack, try a malasada from Tex Drive-In. They’re famous for them. – Akaka Falls and Kahuna Falls are located off the main highway between mile markers 14 and 13, turn off on Highway 220 towards the mountain. Follow Hwy 220 until it ends at the parking area. A $5 parking fee is required. After your visit here, get back onto Highway 19 to continue the journey. – Four Mile Scenic Drive is located off the main highway between mile markers 11 and 10. Turn left, towards the ocean, at Kulaimano Road. Four Mile Scenic Drive will connect back to Highway 19 at the end. If you have the time, we recommend visiting Hawaii Tropical Botanical Garden off Four Mile Scenic Drive. (Admission fee required.) It’s our favorite Hawaii garden. We have visited this garden during a day trip from the Kona side. Though difficult to do, we usually have to limit our time at the garden to just an hour. – See Rainbow Falls and Pe’epe’e Falls in Hilo. Between mile markers 3 and 2, turn right onto Highway 200 (Waianuenue Avenue). Bear right at the fork in the road. Follow the signs to stop and see Rainbow Fall. Get back onto Waianuenue Avenue heading further inland for Pe’epe’e Falls and Boiling Pots. – If you are hungry for lunch and would like to try local food, Cafe 100 in Hilo is a great little place to stop. They are credited with the creation of the Loco Moco. They’re located at 969 Kilauea Avenue (click the address link to create your own directions on Google Maps) near the intersection of Mohouli Avenue. Out of Hilo, take the main highway, which has now become Highway 11. The drive from Hilo to Hawaii Volcanoes National Park will take approximately 45 minutes. You could easily spend a full day or longer exploring all that Hawaii Volcanoes National Park has to offer. Unfortunately, you only have a few hours here, so I will list a few highlights and tips for you to see during your visit. – Be prepared to pay an entrance fee, which is currently $25 per car. When you pay at the gate, the park ranger will provide a useful brochure that includes a park map and highlights. You may want to make the visitor center your first stop to ask for advice for your short stay. I recommend you also ask a park ranger where the lava is visible or flowing — making sure that you ask them how to see it both inside and outside the park boundaries. – See Thurston Lava Tube off of Crater Rim Drive. Update: Thurston Lava Tube has been closed since May 2018. It may reopen in the future. – See the steam vents off Crater Rim Drive. – See Halemaumau Crater and pop into the adjacent Jaggar Museum. Halemaumau has been emitting a billow of volcano smoke since 2008. Ideally, try to see this crater at dusk, where the red glow from the lava lake below is visible. In May 2018, the lava lake at Halemaumau drained and the Jagger Museum closed. The lava is no longer present there. Much of the 2018 volcano activity was centered around the summit area where Halemaumau is. So, from here, you can see the major changes to the landscape. – Drive the Chain of Craters Road until it ends. Holei Sea Arch is located here at the end of the road. During your Big Island visit, lava activity may or may not be visible and accessible. Over our many years of visiting the Big Island, we have been amazed at where the lava pops up, flows, stops flowing and then pops up in a new location. We cannot provide directions or say drive to such and such spot because it’s impossible to predict where lava will be flowing, glowing or visible for your visit. Check the Hawaii Volcanoes National Park’s website that’s generally kept up-to-date. Sometimes it can be a day or so behind. Check the latest Kilauea Status Reports that are updated each morning. There’s a lot of volcano-ese in these reports, but you can glean useful viewing information from them. Update: For a March 2017 visit, the lava was flowing on the surface and into the ocean. To see the lava and save time, we took an afternoon/evening bike and hike tour with Kalapana Cultural tours. We mapped out our day with drive times on Google Maps and made allowances for each stop. Once we calculated all the time required to drive and for each stop and considered when we had to check in for our tour, we determined that we had to drop off visiting the two waterfalls in Hilo. Even so, we had a marvelous day — absolutely amazing! What to do in lieu of seeing lava activity? Instead of lava watching at night, look up to the star-filled sky, weather permitting, at Mauna Kea. It’s one of the best places in the world for stargazing and it’s conveniently on your way back to the Kona side of the island. The best viewing is from the Mauna Kea Visitor Information Station (elevation 9300 ft) or if you want to do less driving stop at the Mauna Kea Recreation Area (elevation 6500 ft). Spend more time at one of the other suggested stops. For example, arrange to take a tour into Waipio Valley as previously mentioned. Another example of where you may want more time is at Hawaii Tropical Botanical Gardens. Get back to your Kona side resort earlier. Which way do you return? If you’ve stayed past sunset, you’ll be driving back in the dark. Therefore, scenery will not be a factor. I recommend you use Google Maps, a GPS device or directions from your phone to determine your quickest route back to your accommodation. In years past, Saddle Road — Highway 200 that cuts across the island — was not accessible to rental car drivers, however it has recently opened and is a very nice road minus any road construction that may or may not be happening. If you do take Saddle Road, you may have an opportunity to do some stargazing, particularly on a moonless night. we followed your itinerary today and had a great day. Thank you so much. Thanks for the nice feedback, Jan! IS this doable with a 2 yr old?? Need suggestions for trip planning on November with a 2 yr old. It’s a lot of getting in and out of a car. There’s probably not much a 2 yr old would find that interesting. Going to Hawaii for 11 days how many are needed for Kauai, Oahu, Maui,and the Big Island? We do not swim so the beach thing is not a factor. I was thinking 2 days for Kauai, 2 days for Maui, 3 days for the Big Island, and 3 days for Oahu. What do you recommend? My wife and I are planning to celebrate our 25th Marriage Anniversary at Hawaii. We are reaching Honolulu on 25th November late evening. And, will be leaving Honolulu on 01st December late evening. We are planning to visit “The Big Island” for a day. Taking the first flight from Honolulu to Kona and come back on the same day by taking the last flight. Thinking of taking a car from Kona Airport and drive. Is it feasible? You wouldn’t be able to do the plan we described in the article as there are no late night interisland flights. Your best bet would be to fly in and out of Hilo. I’ve been 12 times and you lose a half day flying inter island. knock off at least one island, if you are not a beach or golf person then skip maui and add those 2 days to the other islands. 3 Oahu, 4 big island, and three for kauai. the big island is bigger than the other islands COMBINED, so leave more time for that. Question on the trip back to Kona. How dark will the road be/how is the road in general? Worried about it being unsafe to drive at night and/or getting lost (we have GPS on our phones, but i’m wondering if I should bring a device in case). The road is in excellent condition — paved, markings and road signs are visible, and the road is sized well for two-way traffic. There are a few curvy parts, but nothing too difficult or dangerous. Even if you don’t have GPS, there aren’t many routes to choose from so it is easily navigated by map. Great trip plan from Kailua-Kona to Hilo! Made the stops for grinds at Tex Drive-In and Cafe 100. Mahalo! Hi we are a family of 9, I have 4 kids and I have a 69 year old mom who will be on a wheelchair will she be able to visit the Lava Cave? What website do I look for for the Lava Cave at Hilo. Let me know. What else can we do aside from the Lava Cave in Hilo? I have a 15 yr old boy,17,11 and 7 year old girls. Also for Kona if you have suggestions. Are you talking about the Thurston Lave Tube? If so, I don’t believe it is wheelchair accessible. I seem to recall there are some stairs to get down to the tube entrance. We are heading to Oahu for 2 days then deciding Maui or big island for 5 days what do you recommend? With a tour like this car is needed … Any deal places? It depends on what you want to see and do. Every Hawaiian Island is great and worth visiting. We have a 6-hour layover in the Kona airport on our way to Honolulu. What sites can we see with a rental car within driving distance from Kona and get back to the airport in time for our flight? Make sure that you allow time to return the rental car, go back through security, board the plane, etc. What you can see really depends on your interests. There’s a lot you could see. For less than $15, you can purchase a guidebook to help you identify sites that interest you. One that we recommend is Hawaii the Big Island Revealed. It has excellent maps to help you identify where things are. Can you enter the Lava Tubes on your own? Or do you have to go with a tour or guide? We just don’t have the extra 12 hours to do the tour, and we aren’t there the days the Park Rangers do the tour. You can walk through Thurston Lava Tube on your own. No tour is required. Hi, I am visiting big island for 4 nights and oahu for 2 nights with family (2+2) in August. Planning to stay on Kona side and take day trips to VNP, Mauna Kea Observatory, some waterfalls. We are not planning to book any tours. Do you think we need to book any tours? are 4 days enough to visit above mentioned places? Possibly enough time. You always have to make do with what time you have. Only you can decide if you “need” a tour or not. We will be staying in Kona for 7 days and then heading to Hilo for 3 nights (we have a 7 year old that has his heart set on seeing lava flow.) We may need to cut our trip day short by one day and I’m wondering how long it will take to get from Hilo to Kona and if we could realistically leave Hilo in the morning for an afternoon flight out of Kona. Check out Google Maps to determine your route options and drive times. This is exactly what I was looking for, Sheila! Thanks a bunch! Very excited for our first trip to Hawaii and can’t wait to see the beauty of it all! Glad to hear it. Thanks for your comment! You really have a lot of questions. Either start here: https://www.govisithawaii.com/first-time-visitors-guide-to-hawaii/ or seek the help of a travel agent. Are there plenty of gas stations along the way? We’ve rented a Jeep to get around and I know the gas mileage won’t be great. Just want to make sure we don’t get stuck in the middle of nowhere with an empty tank! I wouldn’t say there are plenty of gas stations, but there should be enough for you to keep gassed up. Just keep an eye on your gas gauge and take advantage of stations when you see them. This day trip is exactly what I’m looking for! Can you please share more details as to the timing of each league of the trip (the drive and duration of each activity), approximations would suffice. I’m just trying to getting a feel for recommended time to spend at each location and factor in the travel between locations as well. Just as reference point and use to customize as needed. It would be best for you to create your own customized drive plan in google maps or other map application. Within each link, most or all will suggest time allowances.but really, there’s no one size fits all as some people like to dwell at sites longer than others. do you recommend stopping at “green beach”? Not on this specific drive. That would be quite a distant diversion for this day drive. We are planning a 5 days trip to Big Island at end of May & early June. It will be a family vacation to celebrate two graduates, one high school and one college. We will split our stay between Hilo and Kona like 2 or 3 nights at each town. Are there easy hiking trails along the scenic drives that are suitable for seniors? Do you have other driving day trip recommendations? Some of the stops — Akaka Falls, Hawaii Tropical Botanical Gardens, Hawaii Volcanoes National Park — include a bit of walking on paved trails. We are planning a 9 day trip to the BI with 2 nights in Hilo and 7 nights in Waikoloa. We plan to drive from Hilo to Waikoloa. Will we come across the same scenic spots mentioned above ? If you follow the same route and directions described, even in reverse, of course you will see the same sights. Also, when seeing the falls are you able to get out and hike to any of them for a quick dip? If so, which ones do not require guided tour? Can you also email me your response?? Thank you in advance. I am leaving for Kona in 3 weeks getting stoked….. The last section discusses which way to return. Use Google Maps to get directions for the quickest way back to your accommodations. The last two times we did a drive similar to this, we went via Saddle Road (Highway 200), which was the quickest and most direct route for us. Swimming at the waterfalls is not advised. None of the waterfalls require guided tours. Most are only a very short walk from the public parking areas. We don’t provide individual email support. My apologies! Thank you for the trip advise first off – great ideas! please let me know how your trip goes. My wife and I leave to the Big Island July 20th. Arrive in Kona…will drive from airport to Volcano location and spend a few days in that area (lava pond lodge). Then drive back to Kona and see the sites along the way (waterfalls…) and then spend the last 5 days in our resort (King Landing) relaxing, snorkeling and eating. My wife and I are flying into Kona in the morning and flying out of Hilo that same evening. This itenerary looks like it would be great for us and actually give us more time during the drive since we’re not returning to Kona. Do you agree? If so, please offer advice on where to spend that extra time. I kind of doubt you’ll have a lot of free time. This drive/sightseeing plan is already jam packed and you’ll need to factor in time to pick up your car in the morning and then drive to the airport, gas up, return your car, go through security etc on the return end. We did this drive and lava viewing in March. We created a custom google map with all our stops and factored in how much time to spend at each site. It would probably be useful for you to do the same just to see how much available time you have. This is great info! We are flying into Kona and staying in Hilo and would love to try this. We will have all our luggage in the car though, and I’ve heard not to leave your car unattended. Any thoughts or recommendations? We will be traveling with a disabled child (immobile; wheelchair). Staying in Kona and potentially making a day trip to Hilo via your trip guide. Are there opportunities at these stops for handicapped accessible lookouts or trails? – Hawaii Tropical Botanical Garden – nice, mostly paved paths, though steep. Check directly with them regarding accessibility. – Some of the points of interest at Hawaii Volcanoes National Park are accessible. Again, check directly with them for more accessibility info. I just wanted to thank you so much for all the information you have provided. I have written down so many of your ideas. I was overwhelmed with planning our first trip to Hawaii, and I found your website to be an absolute wealth of information. We head out in one week to spend 3 days in Oahu and 7 days on the big island (5 on Kona side, 2 on Hilo side). We cannot wait to do these day trips! Thank you. Thanks for your comment, Heather! We hope you have a wonderful trip to Hawaii. Please let us know how your vacation goes. We followed the tour step-by-step yesterday, and it was amazing! Instructions and mile markers super helpful, and points of interest were great. Highlights of our trip were The black sand beach at the bottom of the valley at Akaka falls. Unfortunately you can’t get to the falls, but you can drive up to the beach if you have a four-wheel-drive. The Blacksand beach is absolutely amazing right out of a movie or picture book. If you’re prepared you can spend a whole day there. After the beach, we stopped at Tex drive inn, would pass that by next time. Drove the scenic route very beautiful, on our way to Volcano. You might decide to skip rainbow Falls and spend more time in volcano national park. So much to see and do, but make sure you’re at the top for dusk. Then the long dark drive back to Kona twisty and fun but be prepared to do in the dark and yes everybody is very tired… I was gonna say hungry and grumpy but That would be too funny. Thank you so much for all the tips and advice. We will be going back to the black sand beach for the day, the most amazing experience. I am driving from Kona to Hilo to take a Helicopter tour. Google says it’s 2 ½ hrs. I’m hoping to take the 0700 tour. How is the traffic on 200 at that time? Should I pick up my rental car day before? Google Maps has the option to set your start time and factor in traffic. Hello. Quick question….we will be in Kona in May and want to do a day trip from our hotel, the Royal Kona Resort. From looking at the map, it looks like you started much closer to the top. Would you still suggest this itinerary? We want to see waterfalls and beaches on our way and this drive sounds AMAZING. Just want to make sure it would work from our hotel in Kona. We say to make your way to Waimea, so you can do that from anywhere on the Kona side of the island. This plan doesn’t really include much in the way of beaches, but it definitely has amazing waterfalls and lots of other fantastic scenery. We took your suggested trip yesterday and it was perfectly planned out. Even the food stops were timed right. Ended up at volcano right at dusk. We had a 9 year old and 5 year old with us and they enjoyed the trip as well. I would definitely suggest this site to others interested in a day trip. Thank you. That’s great to hear Sara. Thanks for the feedback. I am planning 7 days on the Big Island and want to see as much of the island as possible. I would prefer to stay in one location and do day trips and not have to check out and in to another accommodation but is that doable? If so, if we fly into Hilo or Kona, which location would be the better place to stay to make the most of our day trips? or should I plan to split the trip up and stay half the time on Kona side and half Hilo side? or is there a better place in the middle to stay?